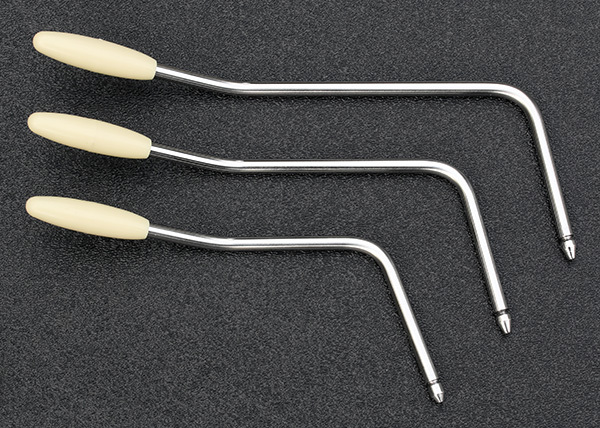 These pop-in tremolo arms are fabricated for the American Professional Strat® that was introduced in 2017. These are NOT a screw-in tremolo arm and will ONLY fit the American Professional Strat®, they will NOT fit the American Deluxe or Elite Strat®. These tremolo arms are made from precision centerless ground 303 stainless steel for a fine finish and strength. Your choice of one of the following four different color plastic tips. Tips screw on and can easily be changed. These tremolo arms are specifically designed around a free-free floating bridge setup. With the two pin pivot tremolo system of the American Professional Strat® the FRONT edge of your bridge top plate should be raised approximately 0.030" from the painted surface of the body, this is about the thickness of credit card, your bridge should only pivot on the two pins, not on the body like a vintage Strat® bridge. The back edge of the bridge should be raised up off the surface of the body by 1/8". With this setup the plastic tip end of these tremolo arms will be placed approximately 2" to 2-1/4" above the pickguard surface when the arm is in the playing position. Your actual tremolo arm tip-to-pickguard surface distance may vary depending on your particular bridge setup. We DO NOT recommend your bridge to be setup as flush with the body, your tremolo arms tip-to-pickguard surface distance would then be greater. These Professional Strat® tremolo arms are fabricated in limited production run quantities due to the extended time it takes to create each tremolo arm. Give us 1-5 days to complete your tremolo arm. Left handed versions may take a few extra days to complete, so please be patient while we work on your order. 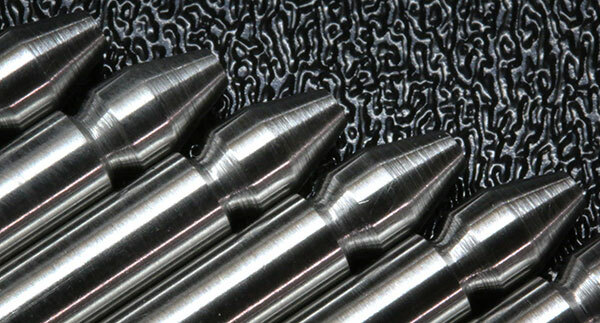 Close-up detail of the machined attachment portion of the tremolo arm.